Benefit of Corporate Representative Depositions - В сложной финансовой ситуации приходит на помощь кредит наличными в Казахстане. Depositions are a routine form of discovery in civil disputes. In disputes involving businesses or governmental bodies (the “Entity”), the opposing party will take what is known as a corporate representative deposition. In a corporate representative deposition, the party taking the deposition will designate topics that they want the Entity to answer questions about. The Entity then has to duty to prepare a representative or representatives to answer questions relating to the topics. The Entity has discretion on the representative(s) it chooses to answer questions relating to the topics provided that the representative(s) it chooses is reasonably prepared. For example, assuming there are ten topics that the Entity will be asked questions about, the Entity may elect to designate different representatives to answer questions on select topics. The benefit of a corporate representative deposition is that the Entity is answering questions on behalf of the Entity (and not necessarily as it pertains to their personal knowledge). This means the representative is designated to bind the Entity to his/her answers to the questions relating to the applicable topics. “As the “voice” of the entity, the witness is required to testify about matters known or reasonably available to the organization. The organization must prepare the designee to the extent matters are reasonably available, whether from documents, past employees, or other sources. That preparation must enable the designee to give complete, knowledgeable, and binding answers on behalf of the corporation. If the deponent cannot answer questions regarding the designated subject matter, the corporation has failed to comply with its Rule 1.310(b)(6)…. Rule 1.310(b)(6) does not require—or for that matter even contemplate—that the corporation produce the witness with the “most knowledge” on the specified topic(s), and the witness is not required to possess any personal knowledge at all. Utilized properly, Rule 1.310(b)(6) streamlines the discovery process and gives the corporation being deposed more control by permitting it to select and prepare a witness to testify on its behalf. In exchange for that control the entity is required to have the right person present at the deposition. This of course benefits the requesting party as it prevents the corporation from frustrating the opposing party’s discovery by simply playing ‘ping-pong’ with him: the first official would disclaim knowledge, as would the second, and so on. Thus, corporate representative depositions are a valuable tool in disputes and should be utilized. 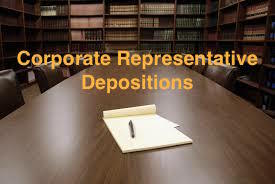 And, a party defending a corporate representative deposition should take steps to determine the representative(s) selected and that the representative(s) is prepared to answer questions relating to the topics. Also, since the representative(s) will be binding the Entity to his/her answers, it is important that objections are preserved for the record during the deposition if the representative(s) is asked questions outside of the designated topic areas. Why? Because you do not want the Entity bound to answers to questions in which that representative(s) was not designated as a representative to bind the Entity.